What’s up Trainiacs? Today’s podcast guest is, again, yours truly, Triathlon Taren. As we’ve rolled out Team Trainiac, which is now live at teamtrainiac.com, and anyone can go there for a 14 day free trial. Go and check it out. Starting to get more and more specific questions about how to train, and these questions typically revolve around what happens when your schedule just goes awry. What happens when you get sick? What happens if you miss a workout? What happens if you’re really busy? What happens if you are getting poor sleep for a few nights in a row? One of the things that I have gone through over the last month in particular as I record this, it’s January 31, 2019, is how do I train when I’m traveling. So today, being January 31, I have been traveling for the master classes producing how to swim with Lucy Charles, how to bike with Cameron Wharf, how to run with Sarah True, and just tomorrow I’m going to go and head to Boulder to produce the how to strength train with Erin Carson, Mirinda Carfrae, and Tim O’Donnell. I’ve been traveling steady since January 5th. In that time frame I’ve had seven days of travel, two overnight flights, been home for only four and a half days. But in that same time, I’ve actually built fitness. When I left for the first day of travel on January 5th, according to my Elevate for Strava app, which is kind of like a fairly simplified version of TrainingPeaks that I like to use because it’s free and it ties into Strava, gives me everything I need, nothing that I don’t. On that day that I left I had a fitness score of 35.4 and it now sits at 40.4, almost a 17% improvement in fitness. Now, I’ve got to put this into some context because it’s not like I’m building massive amounts of fitness and I’m 17% faster. The month before I started my taper leading into Half Ironman Coeur d’Alene in 2018 I had gained 23% fitness, so it’s not like I’m talking peak level of preparation here. Whereas, my fatigue level was managed a lot better in my buildup to Coeur d’Alene because I was at home and I was able to rest more with less overnight flights. Now, I’m fairly fatigued but I have built a fair bit of fitness in that time even though it’s been a really hectic schedule basically being on call to pro triathletes during this time. 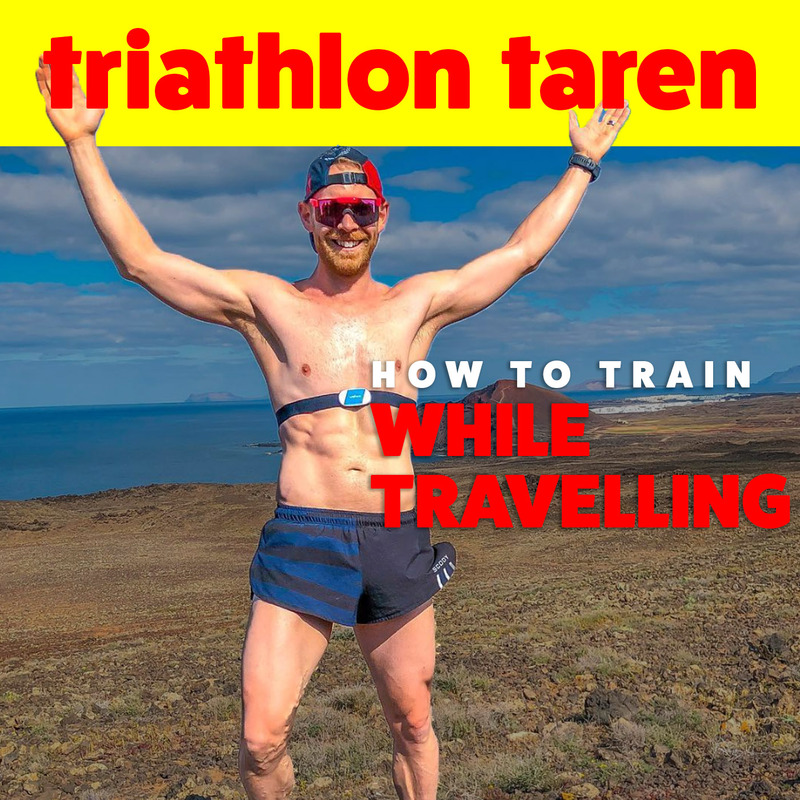 So the question arises, what have I learned over the past couple of years as I’ve tried to mesh being Triathlon Taren, the media guy that’s out there, really busy, going to events, traveling all the time, while still trying to be just Taren Gesell, who is trying to progress in this sport? This relates to not just travel, but what we do day to day in our lives when life happens, when crap happens and all of a sudden we can’t necessarily deal as well with our schedule and get in perfect training. Let’s break it down to what we want to accomplish when we’re training while traveling. Number one, we have to maintain overall health. Number two, we have to maintain a readiness to train. And number three, we have to maintain as much fitness as possible. Now, remember that what I said here is maintain as much fitness as possible, not build as much fitness as possible. Frankly, I’m shocked that I’ve been able to build fitness and I think it’s just really largely due to a few key sessions I’ve sprinkled in here and there throughout the training. And if you look at the course of the month, the last few, I would say week and a half or so, have been largely just maintaining fitness because it’s hard to build fitness consistently, week after week after week, because that fatigue level starts coming in and all of a sudden you can’t keep hitting those key sessions. When people are traveling it’s not typically for a month straight, but to build a little bit of fitness, reasonable, to maintain a level of fitness, 100% possible, but there are some keys for how to do it. Let’s start with how we manage overall health. I’m just going to start rattling off some tips that I’ve found that really address a lot of the things that are pervasive when you start traveling that are going to be detrimental to your overall health. Travel starts, you hop on the plane, and instantly your immune system is going to be under attack. In the cabin of a plane, the humidity levels are roughly about 10% to 20% humidity, while in homes it’s typically in between about 30% and 65% humidity. This is like a desert. What happens is our airways end up getting dried out and because we don’t have that moisture in our airway, there’s a higher chance that we can catch a bug because it’s not filtering out the contaminants in the air nearly as easily. There are a few things that you can do. You can drink lots of water to maintain your level of dehydration and a level of moisture. However, it’s not like a few hours on an airplane is going to rapidly dehydrate you like you’re spending days in, say Arizona, training, but just drinking lots of water is a really good idea. It’ll keep you feeling better, it’ll keep you flexible, which is fairly key when you’re scrunched up on the airplane. But a more important thing is to develop a habit of regular nasal breathing. Nasal breathing filters out a ton more contaminants from the air than mouth breathing does, and a lot of people end up developing mouth breathing habits. Myself, I’m a big mouth breather because I chat a lot, because for years I drank a lot, I ate really inflammatory foods so my nose would get clogged up after a really inflammatory meal, so I would just breathe regularly throughout my mouth and that became a habit. But that’s not a good habit when we have to be looking at everything that we can do that is fairly easy and doesn’t take a whole lot of time to keep ourselves healthy. So develop a habit of regular nose breathing. Well, if you ask most flight attendants, they will say “I would not drink the airline coffee.” Because that water comes from the airplane’s coffee system. If you ask a lot of flight attendants, they’ll tell you that they would not touch the airplane’s coffee. Of course you can go and grab Dunkin’ Donuts, or Starbucks, or if you’re in Canada a Tim Hortons, and take it onto the plane. That’s not a big deal. The offset between the coffee that you take in the diuretic effect of peeing it out, it tends to be basically neutral, so it’s not like you’re going to add to your level of dehydration. But the bigger issue with that airplane coffee is that how they make that is with the water system from the plane. That water system is really never cleaned out, so you just have water and moisture in dark areas. It’s very highly contaminated. It’s a really, really dirty water. It’s like drinking from a pot of coffee that is never rinsed out, never ever ever rinsed out. Stay away from airplane coffee. Grab a coffee before you come on the plane. Next thing is just boosting up your immune system. When I was in Lanzarote at the beginning of the month I got to ride with Patrick Lange. After winning Kona in 2018, he said that he took 20 flights in the following few weeks to all the media appearances with one overseas flight going to CNN in New York, and then back to Germany. He says there’s two keys that he’s found to traveling and staying healthy, and he did this successfully without catching a bug during all of those 20 flights and it was very simple. Number one, frequently disinfecting hands. Every time you see Purell in an airport bathroom or just pinned to the wall, hit that, disinfect your hands. Even though I’m a bigger believer day to day in building up some immunity to the bugs that are in the air by not constantly disinfecting your hands, this is the time that I think it’s a good idea. Second, is that Patrick Lange takes high doses of vitamin C. You can take vitamin C to help with your immune system, or I’m a big fan of our sponsor, Four Sigmatic. They have Chagga, which has similar properties to vitamin C as far as immune function boosting. You can go to foursigmatic.com/triathlonteran, use the coupon code triathlontaren to get yourself 15% off. But taking some sort of supplement that helps boost your immune system is something that Patrick Lange supports. I support it as well. Finally, this is a little bit fringy and if you want to just have an overall better immune system day to day, frequent cold exposure really helps. This is taking an ice bath, and we’re talking ice ice bath. It’s gotta be in between about 40 and 44 degrees Fahrenheit, like really cold. Doing that as little as three times a week for two minutes a time boosts your immune system immensely because it teaches your body how to thermal regulate, be cold when it’s really hot or be warm when it’s really cold. That is one of the biggest taxes on the body, one of the biggest uses of energy on the body. If we can train our body to be better at thermal regulation it takes a load off of our nervous system, helps boost our immune system. And if you really, really want to hack it up, if you are following any sort of fasted workout method, and I’ll talk more about that in another podcast and more posts on triathlonteran.com, doing a light fasted workout followed immediately by cold exposure really ramps up fat burning. It’s a good way to shed weight. Those simple tips, drinking lots of water, developing regular nasal breathing, staying away from the airplane coffee, regularly disinfecting your hands, taking high doses of vitamin C or Chaga, and for bonus points if you start including cold exposure in your day to day routine, you are going to have a perfectly fine immune system while you’re traveling. Next, we have to maintain our readiness to train. Traveling takes a ton out of your body. We all know that. Nobody gets off the plane thinking “Oh, wow. Feel this body of mine. I just feel fantastic. Let me go for a run and crush it.” There are a bunch of things that you can do to maintain your readiness to train so that the damage isn’t quite as bad as it otherwise should be. Number one thing that you need to do is take care of your sleep. Sleep is going to be one of the biggest things that either helps you or hurts you when you’re traveling. Being in different time zones, just the disruption of your schedule, the jarring effect on your body that travel has, it all disturbs our sleep, and sleep is the most important thing that we can do. Getting more than seven hours, probably less than nine hours. There are some people that get 10 to 12 hours, but studies show that right in that meaty zone of seven and a half to nine hours of sleep per 24 hour period is right in the sweet spot that most people are going to get the most benefit from their sleep. Now, if you get less than that, it’s going to have a detrimental effect, and it’s going to make it even harder to train, and it’s going to hurt your immune system. Here are some things that you can do to make your sleep as good as possible, while understanding that it’s not like you’re going to be able to crush hours of sleep when you’re traveling typically. First thing you want to do is fight fatigue and get on the new time schedule as soon as possible. If you are traveling overseas, one way or another, you don’t want to stay on your home schedule. Some people have even tried training themselves to either go to sleep earlier or wake up earlier gradually leading into overseas travel, but this has been shown that it’s very, very difficult to do. It’s almost as detrimental when you are at home as just getting on the new time schedule when you are at the destination. One of the easiest things that’s most practical to do is just fight the fatigue as much as possible, and as soon as you can get on the new time zone schedule, start going by that. One way that you can help this is that I don’t really support melatonin use regularly, but during travel it can be a tool that you use. Now, I don’t recommend using melatonin regularly because it can permanently mess up your melatonin receptors and basically for long, long periods of time mess with your sleep if you take melatonin too often. But temporary melatonin supplementation for five to seven days during travel isn’t really that bad. In this case, if you are going to take melatonin, take it 60 minutes before going to bed. If you mess that up, there’s a chance that the melatonin spike could happen when you’re in the middle of sleep and end up waking you up, so you want to get it right at that 60 minutes before going to bed. Other than that, I recommend very natural methods of getting on the right schedule. Coffee to stay up, realizing that it has a 12 hour half life. So you want to, if you need to stay up, take coffee, supplement with coffee, crush the coffee. Remember, not from the airplane water system, but crush coffees and then 12 hours before you intend to go to sleep, taper it off. Cut it out, no more coffee. Short naps you can also take, and short naps under 30 minutes don’t disrupt your sleep patterns. It just gives you a little bit of a refresher to keep crushing through staying up. But if you go longer than 30 minutes, it starts messing with your sleep cycle later at night and keeps you up. Another thing is the human charger. I get a lot of flack for this, but what this is is it’s a set of earbuds connected to a device that power the earbuds to shine bright blue light into your ear buds, where there are photo receptors that are similar to the photo receptors in your eyes that signal alright, I’m looking at sunlight. It’s daytime. Don’t produce melatonin. But what you can do is if you buy the human charger, there’s an app that you download. You say where your home base is, where you’re traveling to, and it gives you a schedule of when to use the human charger in your ears to help condition your body as soon as possible to get on that new schedule. I’ve actually found that it significantly reduced jet lag. Next thing is blue light blocking glasses. Blue light blocking glasses have been studied and shown to significantly improve your ability to sleep, especially if you’re wearing them within three hours before going to bed. It allows your eyes to block out the blue light that is an indication to not start producing melatonin. So you start wearing these blue light glasses when you’re getting close to going to sleep and your body then is able to, instead of while it’s looking at a TV, or looking at your phone, or looking at a computer, it starts allowing your body to go through the process of getting closer and closer to sleep. I like the true dark shades. They are fairly obnoxious looking, but I like them because they have several different options, some that work for just looking at a computer, some that work for going throughout the day, some that are complete blue light blocking glasses that are great for the last 30 minutes before bed. You start using these if you need to really start instigating the sleep cycle, but are having a hard time doing it. Next, very simply an eye mask. I’m a big fan of, I think it’s the sleep master eye mask, because it covers my ears as well, so it blocks out any of the banging that is going on outside of an Airbnb or a hotel room. Then something that I just tried last week while I was in Tucson with Sarah and Ben True was the sleep with me podcast. Now, it sounds racy. Get your minds out of the gutter. But what it is is it’s somebody who basically tells you a bedtime story, and he tells it in a bit of a weird way that is kind of repetitive, repetitive, repetitive and words that go with that. He strings words together and it kind of just lulls you into sleep and takes your mind off of anything that was racing through it, so you’re not thinking about work, or the meeting the next day, or the training, or the travel. It starts pulling you into more of a sleep brainwave. That might help if you like having sound to help get you to sleep. So that’s sleep. If you can get as much sleep as possible and have as good a sleep cycle as possible, you’re going to stay ready to train. Next is to manage your cortisol level from travel. This is just to keep your level of stress fairly low during travel, and this is very simply things like often when you’re in an airplane you’ll notice that your heartbeat is starting to race a little bit. Just start nasal breathing a little bit, calming yourself down, being aware of it, keeping noise canceling headphones on when you’re in the airport so that the business of the airport, particularly around security and in lineups doesn’t really start affecting you. I like the Bose QC35 headphones. By keeping your cortisol levels down, it’s going to keep your body in a lower inflamed state so you’re just going to feel fresher and not quite as beat up form the travel. Next thing is that you need to maintain your lower back strength from sitting for a long period of time. When you’re sitting in an airplane, you’re scrunched up for a long period of time, inflammation is pooling in your lower limbs, you are often getting a little bit dehydrated, and all of these things combined can lead to a little bit of lower back pain or just stiffness in your lower back. Again, when you get to your destination you might not want to train. One of the best things that you can do is do foundation training. There’s a great book called, I can’t remember exactly what it’s called, but we’ll link to it in the show notes. We’ll link to all these products in the show notes so you don’t have to write all these down. But foundation training book is one of the best things that I’ve found for maintaining lower back strength, because it works on your postural chain. The strength of your lower back, your back, your upper back, keeping your chest nice and open so you don’t start slouching forward and rounding your lower back, potentially leading to back pain. It only takes about 10 to 12 minutes to do a foundation training session. I really like doing it the next day after travel, just kind of sets everything right. The final thing for maintaining your readiness to train is addressing the health effects of being upright. Being upright and sitting for a long period of time starts slowing down your metabolism and it starts creating a lot of inflammation when you’re not moving around. When you’re sitting your metabolism starts slowing down and inflammation starts pooling in your legs. This is very detrimental and can almost start undoing some of the good training that we’ve done. There have actually been studies that show that if you train really hard in the morning, sit all day at work, and then still train at night, some of the benefits of that training in the morning and night are as good as canceled out from that sitting all day. What can undo that is just short walk breaks, so the same principle goes for when you’re traveling. Drinking a lot of water, drinking a lot of coffee if you like coffee, drinking a lot of coffee not from the airplane, but having to pee a lot ends up forcing you to stand up regularly on the airplane. Get an aisle seat I find is the absolute best thing to do. Even if you don’t have to pee, getting up every 45 minutes, stretching your legs, letting that inflammation work itself out, not produce as much lower leg swelling, not let your body start slowing down and that metabolism slowing down and undoing all that training that you’ve done leading into it. Couple of things that you can do practically speaking beyond just getting up, going to the bathroom a lot, is compression socks. They have mixed results in a lot of studies. But when you need everything that you can get, wearing compression socks while you travel, it’s not going to be a bad thing. It’s not like it’s going to undo a lot of training. It might not really add to your training, but for the 60 or 70 bucks that compression socks make and the slightly better results that studies have shown, by all means you can throw on some compression socks. Just don’t be that triathlete that is walking around the airport in shorts and compression socks looking like a total goob. Be cool. Wear them under some pants. Second thing that this has been far more proven to improve mobility in your lower limbs and reduce inflammation in your lower limbs so that you don’t feel as beat up the nest day after travel, is when you get to your destination, Airbnb, hotel, motel, friend’s place that you’re staying at, whatever it is, if you have a time that you’re say reading a book, or a magazine, or responding to emails, or something like that, go and put your legs up a wall. This is sitting basically horizontally, like lying down with your back flat against the floor and sticking your legs straight up the wall. If you can stay like that for 20 or 30 minutes, a lot of the blood is going to come out of your limbs and a lot of that inflammation is going to go away. When you finish, feels really, really good. You’re going to notice a significant difference, and this is going to keep your lower limbs from getting sore and those puffy feet from really developing in the days after travel. Between all of these things if you can get some decent sleep, you can manage your cortisol levels so your body isn’t in a fight or flight mode, constantly stressed out, your lower back is nice and supple, ready to go, and you don’t have a ton of inflammation in your body, you’re going to be fairly ready to train. That then leads into the last part of training regularity. How do we maintain regularity? First thing that I want you do to is get this out of your brain. Get out of your brain the thought that you are going to build a ton of fitness. Sure, I have been able to build fitness. But keep in mind that I am traveling for triathlon. My job is triathlon. Some of the work, air quotes work, that I’m doing, is going for a three hour bike ride with Patrick Lange. It’s going into a pool and filming Lucy Charles, and it’s not like I have to take time away from a conference that I’m at to find time to train. I’m in a bit of a unique scenario where my travel is triathlon. In your case, if you can just maintain some sort of regularity, have something that you do every single day while you’re traveling, it doesn’t have to be huge and fitness building, but just do something, that’s going to accomplish the last thing we want to accomplish, which is just maintaining as much fitness as poss. Here are some ways that you can do this. First thing is the scheduling of the travel. Set yourself up to be able to train by scheduling the travel properly. This means mid afternoon or later flights. I like mid afternoon, say around 2:00, 3:00, 4:00 p.m. That’s like the perfect time because you’ve got enough time to do a workout in the morning before you leave for travel, even a big workout in the morning, and then use that travel time as basically just rest time. You can then get to your destination if it’s not too far away at a reasonable time, get on that new time schedule, and get a decent sleep without too much disruption. A lot of people end up scheduling travel first thing in the morning to get it over with. They go through the tough flight, just get beat up from the flight, and then by the time they get to their destination, don’t really want to do any training. All of a sudden, that day’s totally shot. But in the case of scheduling a mid afternoon flight or a little bit later, you can still train in the morning, have a decent sleep, get up and your next day of training, which I’ll get to in a bit, doesn’t have to be quite so beat up a scenario. If you are doing a longer flight, you’re doing something across continents, you’re doing an overnight flight, what I’ve found that works really well is long layovers. I did this on the way to and from Lanzarote. What I scheduled was an overnight flight, and then there was about an eight hour layover at which point I took an Uber to a local gym, did a training session, came back, and boom, I actually had a good solid training session during travel. It actually broke up the travel really well because I could still get in my training, it didn’t feel like I was just going through 36 hours of straight travel, I had a long enough period of time in between those two flights that I could do some training, I could recover, I could shower, I could even get a couple hours of work done. I found that to be immensely beneficial going there and coming back. Now, when it comes to actually getting in your training, how do you approach this? How do you maintain some regularity while maintaining your health and your readiness to train, not digging yourself into a hole? One of the first things that I have really enjoyed over the past few months is the Aura Ring. This is a heart rate and sleep tracking ring that I’ve just put in place of my regular wedding ring. Looks really good, only needs charging every six or seven days. By the time you hear this there should be the review video on YouTube that discusses everything about it. One of the features of it that I really liked is that it tracks heart rate variability. If you pair that with the free download that you can get at triathlonteran.com/hrvtraining, you start seeing trends. Or you can move your key sessions up a little bit if you know that your HRV ratings are nice and high before travel. You can, in that case, move some of your key sessions up into the otherwise rest days before you even travel. So you’re still going to get a lot of your key sessions in, but what you’re doing is you’re just moving around the rest days and the key sessions, and you know that you are going to be able to do it effectively without digging yourself into a hole because you’ve got that backstop of the HRV rating and the spreadsheet that you’re using to know if you are ready to train and when you can do that. I found that immensely beneficial. Also, if you’re on Team Trainiac, in your panel where the trainiac perks are you can actually go and get $50 off the Aura Ring through that. So go and check that out. Now, a couple of things that you should know if you aren’t using heart rate variability, or if you’re not familiar with it, or if you’re just getting started with it, or just general rules of thumb. When I was in Lanzarote I was talking to Reece Barclay and Lucy Charles about how they travel and train successfully, a lot of what we’re talking about here. What they said is particularly the day or two after travel they need about two easy days to ease into the training. In my experience, as I was looking at my HRV numbers I found basically exactly the same thing. It took certainly the day of training was tough on the body, so the next day heart rate variability ratings were really low. Then the day after, I could maybe start introducing little bits of intensity. Typically, the day after travel is going to be a rest day, so just kind of think that. How do we actually start getting in some training while we’re there? I think one of the best ways to do it is high intensity interval training. It’s going to be extremely, extremely hard for you to get in the two, three, four, five hour rides while you’re traveling, but that doesn’t mean that you can’t get in really good fitness building workouts. In one of the previous podcasts I talked about high intensity interval training, HIIT training, and the benefits of doing HIIT training as it relates to not just speed, and strength, and building your mitochondria, and your body’s ability to go really fast, but it also helps your endurance. HIIT training is really good because you can go into a hotel gym where they’ve got a bike, or we’ll talk about bringing your bike later. You can set up your bike in your room, or you can go for a run. And if you do a 30, 35 minute high intensity interval training session every single day, you are going to maintain a ton of fitness, if not build it. Trying to do those middle of the road 60 to 120, 180 minute workouts, going to be almost impossible and it’s not a big return on your investment given the time constraints that most people have when they’re traveling. So HIIT training I’ve found to be really, really practical when you start traveling. If you want to swim, ideally you can go and head to a pool and do some of your shorter sessions in that pool and get your swimming in. If you can do that, great. Go ahead and do it. A lot of local master’s clubs will let you join up for a drop in fee. But if you can’t get to that, what you can do is even if you’ve just got a tiny little pool in your hotel at your Airbnb, take two inner tubes from your bike and you tie one of them to your hip and you tie the other one around say a ladder that’s on the side of the pool, and you can essentially get an endless in a hotel gym and get a decent pool workout in for nothing. But here’s the be all end all of ideal travel working out. Bring your bike with you if you can and if it makes sense. So a travel case, I use the Biknd, B-I-K-N-D, travel case. I’m not particularly partial to it. The inflatable sides, they’re never inflated when I get there. The wheels have fallen off, but it’s a travel case. All travel cases are kind of similar. A couple of things that I really like about traveling with my bike even if I’m just going for a short period of time, is number one, it’s easier to do a HIIT training session on a bike than say running or swimming, so I can get in a really high intensity interval training session. You might be saying “Well, what if I’m going to New York and there’s absolutely no way that I’m going out on those streets?” Well, in that case, get yourself the Omnium trainer. If you’re going to go through the effort of packing up your bike and traveling with it, get the Omnium travel trainer. This is just a 14 pound trainer where the rollers are about 6 inches wide. It folds down so small that you can fit it in any checked luggage. Some people even use it as a carry on. The Omnium, I think it’s the Omnium … There’s two levels. The second level Omnium trainer that’s a little bit more expensive has enough power or resistance in it that I was able to get up to about 600 watts in some efforts that I was trying to do while I was in LA. So you can just in a hotel, unpack your bike, go on the Omnium trainer. You can be in your position and get easy HIIT training workouts in. Another benefit of the travel case is that you can put your swim gear in that travel case. Often, swim gear tends to get bulky when you get fins, and a pull boy, and snorkel, and paddles, and stretch cords, and your goggles, and all this stuff. It tends to take up a lot of space because it’s really oddly shaped and bulky in a checked bag, but you can just put it inside the frame of your bike and boom, you’ve got all your swim gear with you. This is what I’ve done that I’ve been able to get really good HIIT training sessions in on the Omnium trainer, really good swim sessions in at whatever local pool there is, really good run sessions in because I either just go on a treadmill or leave from whatever Airbnb I’m staying at, and this is how I’ve been able to tie it all together and actually build some fitness while traveling. So I hope that this gives you a little bit of context for how to effectively train while traveling. Like I say, don’t expect to build a ton of fitness. It’s fairly impractical to do that because often when we’re traveling it’s because there’s something really big and important that’s happening, whether it’s family, whether it’s work, whether it’s a conference. It tends to be busy and it’s disruptive to our schedules, so it’s very difficult to expect to build fitness. But keep in mind that you can go and take five days completely off, whether you’re sick, or injured, having poor sleeps, or whatever it is. It takes about five days before you really start losing fitness, so don’t start getting antsy about losing fitness on your travel, especially if you can use some of these techniques just to get in something every single day, even as short as a half an hour with these techniques. Making sure that you are staying healthy, making sure that you are maintaining your readiness to train, so that you’re not training trying to air quotes maintain fitness, but meanwhile you’re just pounding yourself into oblivion and digging yourself deeper and deeper into a hole, actually doing the opposite that you’re being detrimental to your overall health and decreasing your readiness to train when you get back home. Use all of these tips, use some of these tips, use none of these tips, and just put a pin in this podcast, save it for later. If you ever start traveling in the future I hope that this helps. As always, I said a lot of links, and studies, and gear, and gadgets that you can go and use for your travel. All of those will be listed in the show notes, so go check them out triathlonteran.com, and go kill your training, Trainiacs.